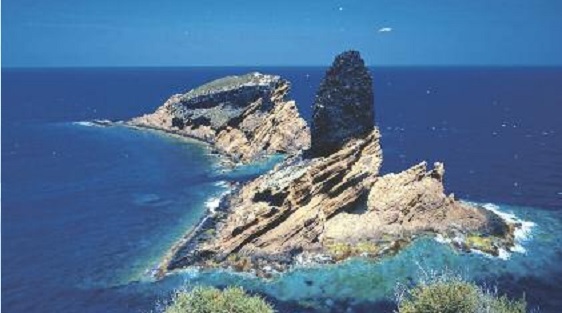 Columbrete Islands, a big Mediterranean marine reserve. The dive presented here can be done by snorkeling and also with your scuba unit. If you choose to use your scuba unit then the route would begin at the mooring buoy number 8, where you anchor your boat. The dive starts at just about four meters deep and drops quickly to 15-16 meters. At Grossa Interior, we head to the northern tip of the island, where we find a bottom made up of large stones and rock platforms in a labyrinth configuration that hides enormous lobsters which are protected by the beautiful groupers. It is a medium-depth dive site that is ideal for enjoying a range of marine wildlife. Species to be seen include: Golden Bream, Barracuda, Octopus and Pen Shells that stick out from the clear sand. Upon reaching the northern tip we turn back to the wall of the island and we return to the mooring buoy. 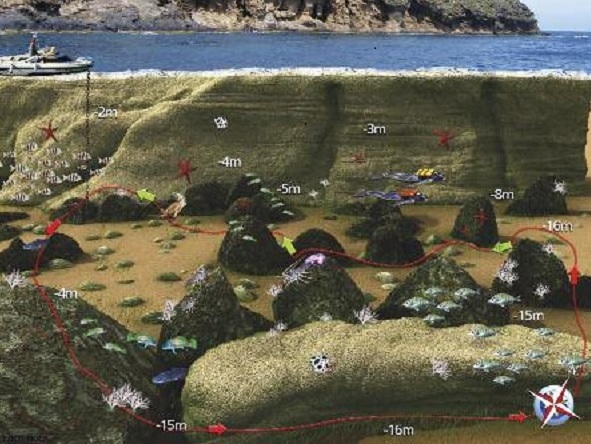 To enjoy the abundance of the aquatic life around the Columbretes Islands it is not necessary to leave the area. Further out the depths increase and advanced or tech training will be necessary.